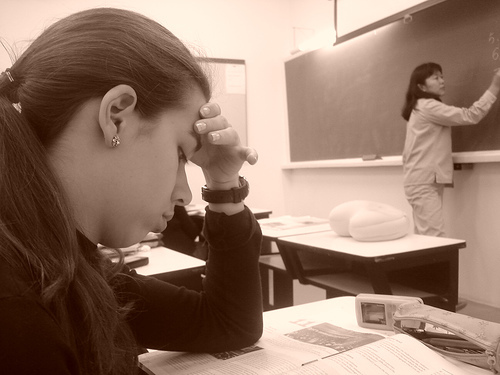 For many teens, exams are just a big annoying disruption to their social life. Instead of planning their study time carefully, they find it extremely difficult to knuckle down – even when their exams are only days away. Procrastination. It gets us all. But it seems to be a particularly rampant disease amongst teenagers faced with upcoming exams. We want to share something with you that still helps us get off the couch and move to our desks when we need to study. The lives of every single one of us – you, us, and certainly your teen – are largely governed by a concept called Pain versus Pleasure. We tend to avoid stuff we don’t like… be it exercise, paperwork, tax returns, meeting up with that friend you don’t really like, etc., etc., etc. Whereas stuff we find pleasurable we tend to gravitate towards… unhealthy foods, coffee, buying nice stuff to put in your house, etc. Unfortunately, many teenagers naturally consider studying to be painful. Whereas watching TV / checking Facebook / playing Playstation is, of course, much more pleasurable. Procrastination comes alive in force! Many teens still find studying painful enough to avoid right up to exam week. But then suddenly – sometimes when their exam is only days away – they know they are certain to fail unless they start studying right now. It’s at this tipping point that the thought of failing is more painful than studying – so they finally head off to their desk. It’s a terrible irony that when we’re at school and have all the opportunities in the world we don’t appreciate or realise it. It’s only when we’re older and wiser that we have the ability to see how incredibly important it is to have a good education. Once your teen is aware that they’ve been a slave to the Pain versus Pleasure way of thinking (as everyone is! ), they’re in a position to change what they associate with each. What your teen needs to do is a bit of a projection-thinking exercise, and cast their minds into their future. They might consider doing a few hours of study to be a painful exercise. But what they really need to understand is just how awful their future may be if they don’t get off the couch and go and study right now. Unless they want to be stacking shelves at their local supermarket for the rest of their life? Probably not huh. What other thoughts might help your teen to associate pain with not studying? How about not getting into the university they want? Or not getting into whatever course they want to do when they leave school? How about having to repeat the year level they’re doing this year? How about disappointing you, their parents? How about having no options later on in life and being stuck on minimum wage? How about not having money to do and have the things they want? We could go on, but hopefully you get the gist. Teenagers who put in the study they need to – even for practice exams – associate pain with not studying. This is the place we want YOUR teen to get to. Hopefully your teen will harness the power of this technique after you’ve had a chat with them about it. It really can be powerful. All it takes is just a bit of insight on your teen’s part (and of course the study still needs to be done!). Once they get Pain Vs. Pleasure, they should find the tough process of starting to study a whole lot easier. We talk about Pain Vs. Pleasure and have several exercises for your teen to complete that will help them overcome procrastination in our Motivation and Procrastination Package. 5 ways to destroy exam-time stress Does Death Metal Help Your Teen Study? Subject Maps: Your teen’s study road map The Art of Purposeful Study Is Your Teen Using Their Learning Style To Study Yet? Can i have the citation of this article? Thank You!